Paytm has become the go-to digital payments app for many people in India after the demonetisation drive, and the company has added thousands of merchants to its platform within days of Prime Minister Narendra Modi’s announcement of scrapping Rs. 1000 and old Rs. 500 currency notes. From vegetable vendors to grocery stores, everyone is joining the Paytm cashless payments platform. But there has been some confusion regarding what happens after a merchant receives a payment from a customer via Paytm. How should merchants transfer money from their Paytm Wallet to bank accounts? 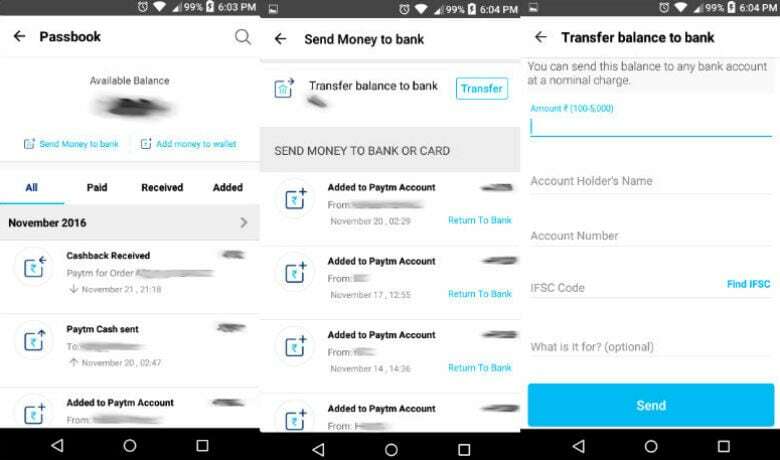 Scroll down to find out the simple process to transfer money from your Paytm to bank accounts. In order to transfer money from your Paytm wallet to a bank account, you need the name, account number, and IFSC code of the bank account holder. However, there is a Rs. 20,000 limit on transactions (Rs. 50,000 for merchants) if you haven’t got your KYC (Know Your Customer) process done. if you need to transfer more than the limit, then you will need get in touch with Paytm to get your KYC done. Transferring money from your Paytm Wallet to bank account was free of charge till December 31 for merchants who have done KYC, but not anymore – users have to pay a fee of 2 percent now. You can send a minimum of Rs. 100 to your bank account via the service. Every Paytm users can transfer up to Rs. 5,000 at a time, with 25,000 per month the limit. If you are a merchant, you can transfer up to Rs. 50,000; with the limit going up to Rs. 1 lakh if you are a user who’s done his or her KYC. Check out our similar guides for MobiKwik and FreeCharge.